Anaheim, CA. This was our second event with Keller Williams as a member of their National Approved Vendor Program. Our sales team consisted of Caitlin Thornburg, our Executive VP of Sales; Account Executive Sheri Young and Brokerage Coordinator Teresa Oskam. We met with thousands of KW associates and had an overwhelmingly positive response to our product and family business. 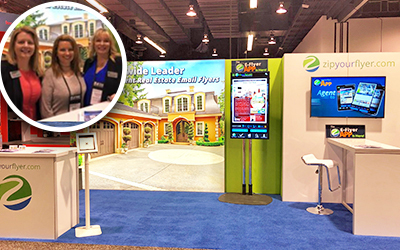 This was the first event where our brand new Internationally Patent Pending E-Flyer App was released and shown to the real estate industry. We had great feedback and expect to see great things as agents add the only E-Flyer App to their daily routine. (Check back next week for full details about the new E-Flyer App). The biggest takeaway from the event was actually the story of Zip Your Flyer. Associates were very pleasantly surprised to find out that we are founded by a real estate agent husband and wife team and still operate as a family business. Real estate is a business based on earning the trust of consumers and agents in return want to be in business with companies they trust as well. We guarantee our product because we know it works and we stand behind it. We learned a lot from our associates at the event and are always trying to improve our business based on suggestions and feedback from agents. Thank you to all of our agents for your continued business.